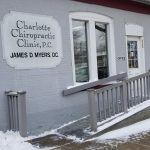 Well established practice of 42 years is located in downtown Charlotte, Michigan, population 7,552. The office building is the oldest public building in the state. The holistic practice has a family atmosphere. The practice grows by patient referrals. Primary adjusting technique is Pulstar method. Also Cox flexion table and SOT. The business utilizes digital X-ray, multi radiance MR-4 laser stem, Acom system; electronic health records (EHR). In addition; Baps board, Wobble chair and Body vibe. Great sports and band programs. Driving distance to all the big cities; Lansing, Grand Rapids, and Kalamazoo.